Is your microwave oven covered in baked-on food splatters and spills? Or smells terrible like burnt popcorn? You can quickly clean it with typical household items that are environmentally-friendly and have minimal cost. To clean and lightly deodorize your microwave use a microwave-safe bowl and mix ½ cup of white distilled vinegar and ½ cup water. 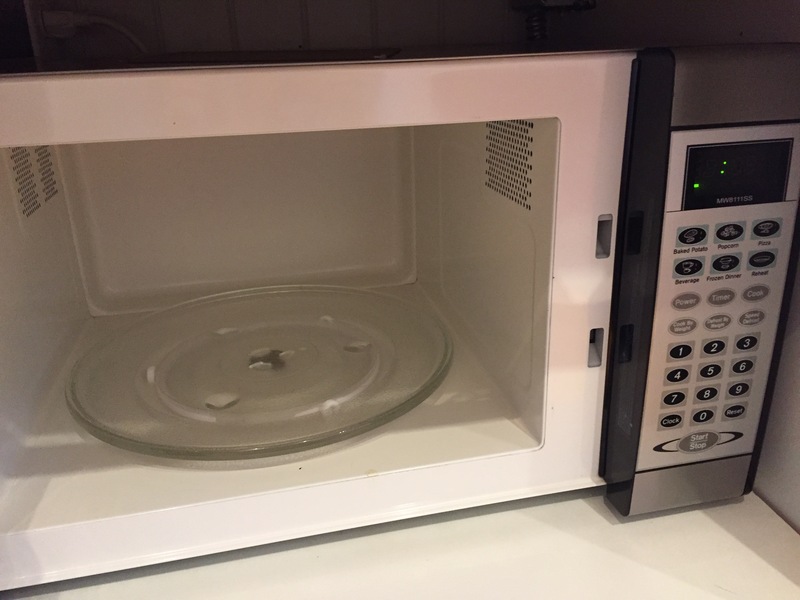 Each microwave oven has different power wattage, so simply bring the mixture to a rolling boil inside the microwave about 4-6 minutes on average. Keep the microwave oven closed for a few minutes to allow the stream will loosen baked-on food splatters and spills and lightly deodorize. The mixture can get very hot so wait until cooled enough to dip a clean cloth or sponge into the mixture to wipe the inside of the microwave including the roof, walls, use a tooth brush to get the edges and corners, and glass tray. The glass tray may also go into the dishwasher to clean and sanitize as needed. If the inside of the microwave oven is dirty, so might the outside. Use the remaining warm vinegar and water mixture to wipe the outside surfaces of the microwave oven including vents in the back of the microwave oven. The vinegar mixture only lightly deodorizes the microwave oven, so if your microwave oven still has some odors try using a lemon or vanilla extract. To use a lemon to deeply deodorize, cut the lemon in half and place cut sides down on a microwave-safe plate with a tablespoon of water and nuke for 2-3 minutes and leave in the microwave oven for an hour keeping the door closed than remove and wipe out microwave oven. To use a vanilla to deeply deodorize, use a microwave-safe bowl mixing 2 tablespoons of vanilla with a ½ cup of water and nuke for 2-3 minutes and leave in the microwave oven for an hour keeping the door closed than remove and wipe out microwave oven. PS: If you use lemon to deeply deodorize your microwave oven, simply cut into smaller pieces and clean your garbage disposal by running with the lemon pieces and water through it.